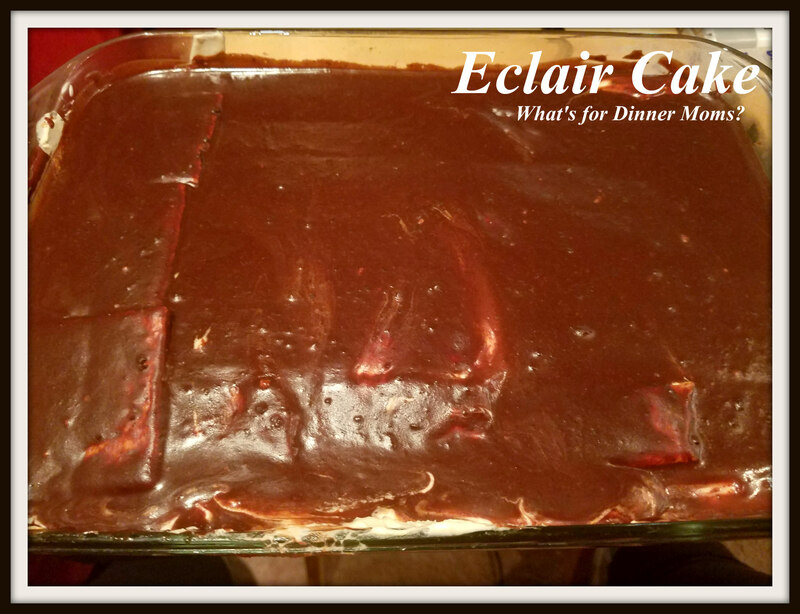 Chocolate Eclair Cake – What's for Dinner Moms? So, for Throwback Thursday I decided to visit an older post and remake it to see if it still holds up. Often we change how we cook something or add a new special ingredient or take something out but don’t go back and change the original recipe. I decided this year to go back and make a few of our favorites from time to time to see if they still work. 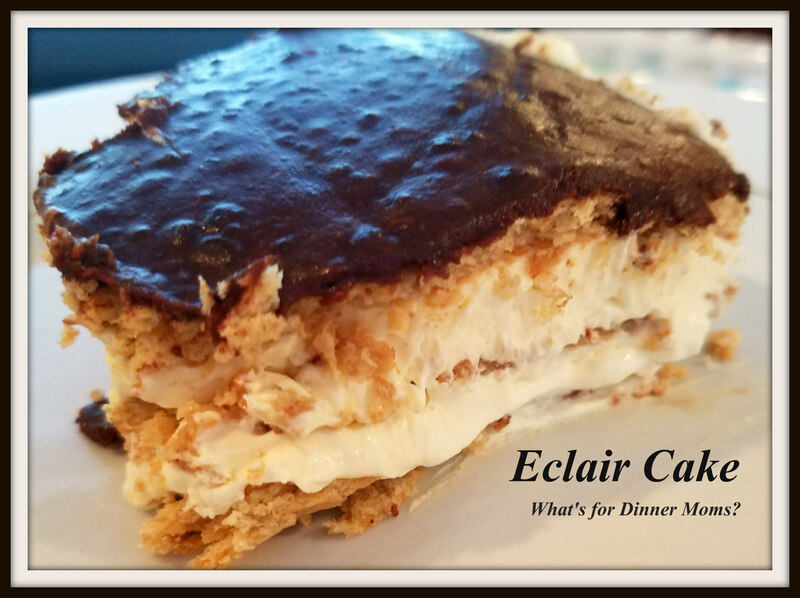 This recipe for Eclair Cake from High Heels & Grills.com (click for link to original recipe), that I first posted in February 2015, is simple and I had most of the ingredients on hand so decided this would be our first test recipe. This was delicious and super easy. It took about 10 minutes to put together and then about 8 hours in the refrigerator to set. Everyone loved it. For something so simple this was a highlight of the day. I preferred this recipe over many of the others I looked at for a similar cake because it had a homemade icing on top. Most other recipes I saw called for chocolate canned frosting. This one had a great dark chocolate taste just like real eclairs! Beat milk and vanilla pudding mix in a large bowl for 2 minutes. In a 9×13 inch pan, layer graham crackers to cover entire bottom of pan. Pour 1/2 of the filling mixture over the graham crackers. Put the second half of pudding mixture on top and level. In a separate bowl, microwave the butter and milk just long enough, that they are melted together. Pour frosting over top of graham crackers and smooth out nicely. Cover loosely with aluminum foil (or you will get a hole in it like my picture has). Refrigerate for at least 8 hours. You do not want to skip this step as this is what gives it the eclair texture. Otherwise it will be too crunchy. Let me try this recipe first and then i will share my thoughts on this. I think my kids will love this! It is simple and sweet. Hope they like it. Thanks for that recipe! I love Eclair Cake. Your recipe sounds so simple. I will print it right away, Marci! This sounds like a great dessert to take to a summer potluck. Thank you! It certainly is! It is so simple.